15 | June | 2015 | Troy C. Wagstaff aka CallahanWriter Blog: Topics of interest include Western Historical (1865-1899) Topics. Additionally inspirational Christian and Fibromyalgia interests. Is fibromyalgia the end of life as we know it? Yes, it is. It is common sense to try and be as positive as we can be when dealing with a chronic illness such as fibromyalgia. I agree, we should be positive. I have had fibromyalgia for more than thirty-one years. When it comes to fibromyalgia I do not know it all, but I can speak with a degree of experience. 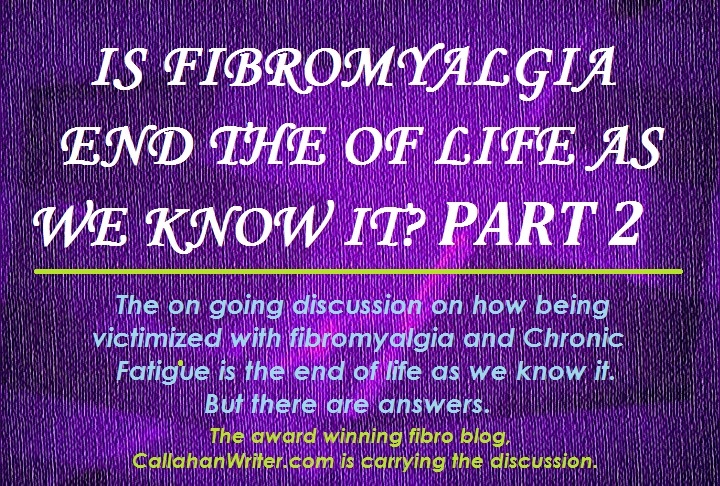 Before we can improve our situation we need to come to terms with the idea that life as we knew it before fibromyalgia, is over. But that doesn’t mean our lives are over, only that our pre-fibro life is over. That’s not a negative thing to say, it’s a reality. If we can accept that reality, then we can move forward in our new life. A life filled with chronic pain, fatigue and fog. We can move forward in spite of the painful flu-like body aches and muscle spasms and bone crushing pain in our joints, lower back and hips. We can go on to a somewhat fulfilling life in spite of the memory problems and other cognitive issues we call fibro fog. We can get some meaning out of life despite all the other symptoms of this dreaded disease. But first we need to understand the things we once did, will need to be eliminated or greatly modified. The expectations we once had, need to be adjusted to meet our current circumstances. Once we come to this settlement in our minds, we can do great things relative to our new pain filled life. If you have fibromyalgia, then I know you feel the pain and frustration, but do you feel unfulfilled as well? Do you feel as though life is passing you by? Doesn’t it seem like all we do is try to make it through the next flare up? Are we so consumed with the pain, the fatigue, the fog and the malaise that we cannot seem to focus on anything else? Here are four steps in moving on to a fulfilling new life in spite of all the symptoms of fibromyalgia. So how do we move beyond the confinement that fibromyalgia imposes upon our life? Most people experience guilt because they are no longer doing what they used to do. The guilt comes from letting people down who continue to expect us to perform at the same level we did prior to fibromyalgia or chronic fatigue. We feel guilty for agreeing to do something for someone and then can’t live up to other peoples expectations of us. Living with fibro you know that symptoms can rise and fall on a daily basis. We have no control what this afternoon will bring or what tomorrow morning will bring. We can wake up one morning feeling good and by the time we shave, shower and eat breakfast we begin to feel weak from the pain and exhausted for no good reason and can’t remember what you ate for breakfast. All our plans for the day are shot. That makes many people feel guilty and guilt causes stress and stress can easily contribute to feeling worse. Guilt has its place in life, but not for the way we are forced to live as fighters and survivors of fibromyalgia. If we commit a transgression we should feel guilt, but we do not need to feel guilty for letting people down because we are in too much pain to move about or we are too fatigued to get off the couch or out of the bed. For those kinds of things we do not need to feel guilty as it will only compound our pain, fatigue, fog or other symptoms. GET RID OF GUILT! We need to manage our own expectations and we need to help others understand our limitations. We cannot do what we once did. The pain is unrelenting and the fatigue is so overwhelming. There are so many symptoms that constantly get in our way. There is no way we can do what we used to do. We need to be realistic with our expectations. We can plan to do whatever we want, we have that right. But living up to it, that’s a whole different issue. We cannot control how fibromyalgia flares up or when. A friend calls you up and wants to go see a movie tomorrow night. You say “great.” Tomorrow night comes and we get hit with a flare up. You call your friend and cancel your plans because the pain is unbearable. It feels like you have the flu and can hardly breath thru the pain. You ache all over. Do you feel guilty? You might, but you shouldn’t. Why should you or I feel guilty about the chronic, invisible illness we have? We didn’t ask for it. We didn’t choose it, it chose us. It’s hard for us to plan in advance any kind of activity so we have to manage our expectations and the expectations of others. When we talk about giving up the past, we’re talking about letting go of the past that motivates our actions today. We’re talking about the past where we worked fifty or sixty hours a week and still had time for activities with family and friends and have a full and fun filled weekend. We can hold ourselves to the old standard. We need to let go of it and accept our new standard and plan accordingly. Since we can no longer hope to live like that again, why should we obsess over it and make ourselves feel guilty and stressed? We shouldn’t. We need to focus on a stress free life and obsessing over the past will do you no good. We need to let go of that type of our past while holding on tight to the memories of the past. We need to learn what we are capable of now that fibro afflicts us on a daily basis, on an hourly basis or on a minute by minute basis. We need to understand that while there is still life left in us and we can still live a life worth living, we have limitations. Sure, we can break those limitations, but fibromyalgia shows no mercy, it has no grace, it demands consequences to our actions however unfair that may seem. We need to understand that there are things we can do if we pace ourselves. What we might have accomplished in a day, back before fibro set in, may take a week to do now. Maybe you can’t go hunting anymore, maybe you can’t move the refrigerator out to clean behind it anymore, maybe you can’t do all the housework and laundry and spend time with your kids like you used to. We need to understand that we can do some of those things with proper planning and with extra time figured into those activities. So focus on what you can do. Instead of moving the refrigerator focus on the fact you can still sweep the kitchen floor once every few days. That’s better than nothing. Maybe you can’t go hunting anymore, but you could perhaps enjoy a mild walk on a simple nature trail. Forget that fridge and prioritize. Perhaps it’s better to forget certain house cleaning chores so you have the energy to spend time with the kids. I have found these four things, and several more that will be covered in later posts, have been valuable to me in coping with fibromyalgia and helped me achieve a new normal living with fibromyalgia. Life is far from the way it used to be but life is tolerable now. Share with us what has helped you live a new life with fibromyalgia? Please make sure you have elected to follow this blog so you won’t miss the rest of these posts and other fibro related posts.